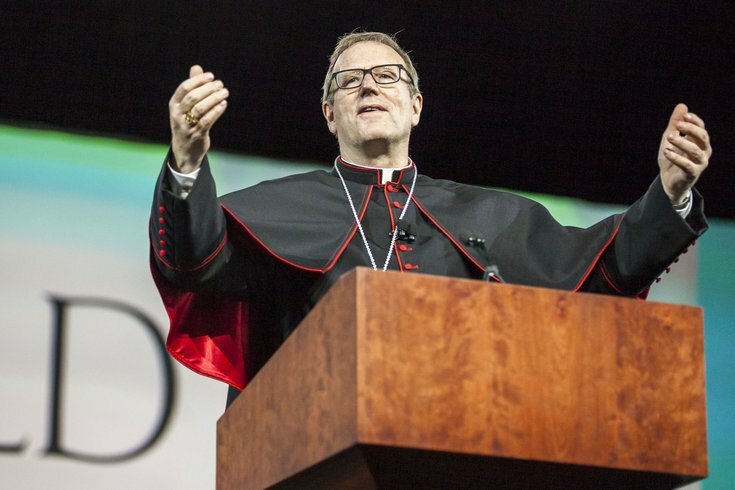 Bishop Robert Barron gives the Keynote Address, Tuesday, September 22, 2015 at the PA Convention Center during the opening day of the World Meeting of Families in Philadelphia. Bishop Robert Barron urged the Catholic church Tuesday to rediscover its mission to sanctify the world by confidently proclaiming gospel truths during the first keynote address of the World Meeting of Families. Thousands of Catholic pilgrims crowded into a massive hall at the Pennsylvania Convention Center Tuesday to hear Barron, an author and auxiliary bishop of the Archdiocese of Los Angeles. "Ever wonder why our society has become so secular?" Barron asked. "So many Catholics have stopped going to Mass. The source in Christian life — most of us stay away from it. ... We, to a large extent, have lost our sense, our mission, of how to sanctify the world." Barron took aim at a complete freedom of expression, saying true freedom comes from living within the framework of God's law. He used golf as an analogy, saying a novice never will perfect his swing if he is simply told to swing however he wishes. Instead, guidance is needed to construct a disciplined golf swing that enables the golfer to accomplish his goals. "The law is not the enemy of freedom," Barron said. "The law is the condition for the possibility of freedom. What I am seeking is freedom to play the game. I want to be free. The law is going to set me free." Barron encouraged the church to provide a guiding voice to a sinful world. He said guidance most be given without aggression and hatred, but with mercy and love. The diverse crowd, featuring people from across the globe, applauded throughout Barron's remarks. "I appreciate how highly intelligent he is and how he talks on a human level," said Wayne Roy, 61, of Potosi, Missouri. "Living in the image of God, as he started out and ended, is our main goal — and bringing that out into society." Roy said he hopes to witness revitalization in everyone throughout the World Meeting of Families, a triennial Catholic convention that emphasizes issues facing families across the globe. "My hopes are just that, as a whole, humanity rises to more Godliness," Roy said. "That's the vision. Our goal is to be united with God and with each other. I'm hoping this will draw us nearer to Him." Barron also charged the families with teaching "basic moral truths," urging parents to pray with their children and attend Mass together. Such families are prepared to speak truth to a wider society, he said. "Does anyone find it puzzling that when the family breaks down, society breaks down right behind it?" Barron said. "It shouldn't puzzle us if the family is the basic building block of civil society." Many in the crowd lingered in the convention hall following Barron's address, preparing for the first Mass of the conference. Jan Figenshu, 63, of Madison, New Jersey, said she particularly was impacted by Barron's call to speak prophetic truths to the world. "If we're not saying it, it's not being said." Figenshu said. "I thought that was really powerful. It was neat to see it in this context — just to see the real cross-sections of the church hearing the message and taking it to heart." Martin Therer, 44, of Bromont, Qubec, also said he was struck by Barron's call for Catholics to confidently express their faith. "To be free, we need to follow the law," Therer said. "The law is there to express our freedom. The more we follow the law, the more we'll be free."